Having a backup solution to protect the vital files on your computer is one of the most important aspects of being a protected computer user. Vital files include documents that you create as well as other unique files such as photos, music, email, and presentations. Backups are particularly important for business documents, research projects or business	proposals that can represent weeks or months of work, and that can be nearly impossible to recreate. Digital cameras make backup systems vital to everyone who takes pictures. Who wants to lose those memories? Backup solutions can take many different forms, and are relatively easy and inexpensive with the availability of today's hardware and software. The right answer is the one that suits your needs, and we can help you find it, implement it, and automate it. Don't wait until you have a catastrophic disk drive failure to realize the importance of backing up your data. And yes, some day your drive will fail. We all die eventually, even our cyberselves. Let Altitude Data implement a customized backup solution specifically for you. We can recommend additional software you may not be aware of to optimize your system safety. In some infections, or for other reasons, data may already be lost before we arrive. We do notoffer clean room services, but in many cases can still recover data you thought was lost. This depends largely on how long it has been since you lost it. If you need data recovery, call us today, or it could be gone forever. A backup in which all of a defined set of data objects are copied, regardless of whether they have been modified since the last backup. A full backup is the basis from which incremental backups are taken. A Full Plus Incremental backup aims to make storing several copies of the source data more feasible. At first, a full backup of all files is taken. After that, any number of incremental backups can be taken. There are many different types of incremental backups, but they all attempt to only backup a small amount of data relative to the full backup. Restoring a whole system to a certain point in time would require locating the full backup taken previous to that time and the incremental backups that cover the period of time between the full backup and the particular point in time to which the system is supposed to be restored. The scope of an incremental backup is typically defined as a range of time relative to other full or incremental backups. Different implementations of backup systems frequently use specialized or conflicting definitions of these terms. The capacity/price ratio of external hard disk backup has been rapidly improving for many years. This is making it more competitive with magnetic tape as a bulk storage medium. The main advantages of hard disk storage are low access times, availability, capacity and ease of use. External disks can be connected via local interfaces like SCSI, USB, FireWire, or eSATA, or via longer distance technologies like Ethernet, iSCSI, or Fibre Channel. Some disk-based backup systems, such as Virtual Tape Libraries, support data de-duplication which can dramatically reduce the amount of disk storage capacity consumed by daily and weekly backup data. A recordable CD can be used as a backup device. One advantage of CDs is that they can in theory be restored on any machine with a CD-ROM drive. (In practice, writable CD-ROMs are not always universally readable.) In addition, recordable CD's are relatively cheap. Another common format is recordable DVD. Many optical disk formats are WORM type, which makes them useful for archival purposes since the data can't be changed. 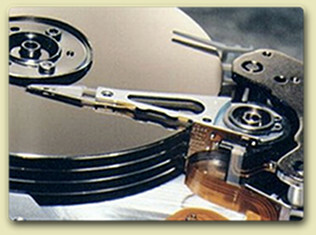 Other rewritable formats can also be utilized such as CD-RW or DVD-RAM. The newer HD-DVDs and Blu-ray Discs dramatically increase the amount of data possible on a single optical storage disk, though, as yet, the media may be cost prohibitive for many people. Additionally the physical lifetime of the optical disk has become a concern as it is possible for some optical disks to degrade and lose data within a couple of years. Also known as flash memory, thumb drives, USB flash drives, CompactFlash, SmartMedia, Memory Stick, Secure Digital cards, etc., these devices are relatively costly for their low capacity, but offer excellent portability and ease-of-use, though they are impractical for full system backups. As broadband Internet access becomes more widespread, remote backup services are gaining in popularity. Backing up via the Internet to a remote location can protect against some worst-case scenarios such as fires, floods, or earthquakes which would destroy any backups in the immediate vicinity along with everything else. There are, however, a number of drawbacks to remote backup services. First, internet connections (particularly domestic broadband connections) are generally substantially slower than the speed of local data storage devices, which can be a problem for people who generate or modify large amounts of data. Secondly, users need to trust a third party service provider with both privacy and integrity of backed up data. The risk associated with putting control of personal or sensitive data in the hands of a third party can be managed by encrypting sensitive data so that its contents cannot be viewed without access to the secret key. Ultimately the backup service must itself be using one of the above methods, so this could be seen as a more complex way of doing traditional backups. As you can see there are a number of possible solutions and we didn't even cover them all. We will meet with you personally and design the most efficient and cost effective solution around your specific needs. Let the experts at Altitude Data help you secure and protect your data.